The leading cause of brain injuries are from concussions. This is a blow or jolt to the head that can change the way that the brain functions. Concussions happen every 4 minutes in Canada, which can potentially lead to a traumatic brain injury. About 144,000 Canadians will receive a complex concussion each year. This is when there is a brief loss of consciousness or symptoms lasting longer than 15 minutes in length. In many cases, younger people are more prone to concussions. One third of all concussions occur before completing high school, as younger students are more active in sports. There are 3 categories that concussion symptoms fall under which include physical complaints, behavioural changes, and thinking problems. Physical complaints include headaches, dizziness, vision problems, and sleeping problems. Behavioural changes include moodiness, anger, and inability to sit still for long periods of time. Lastly, thinking problems include difficulty making decisions, “foggy” thinking, or problems remembering simple words. 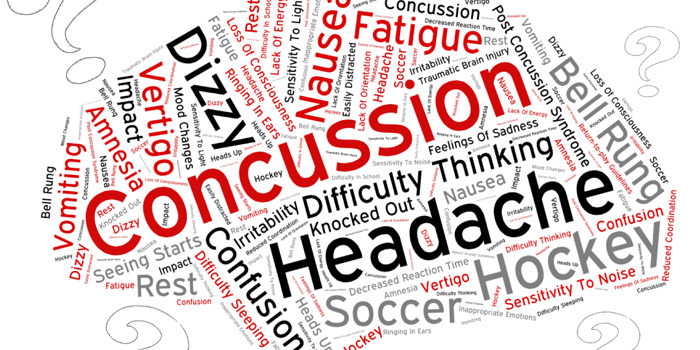 Symptoms vary greatly for each patient, as symptoms tend to be more prominent when the individual suffering from the concussion engages in any strenuous activities. If symptoms continue for a couple of weeks, this means that the brain has been injured and has not healed itself. For this post-concussion syndrome, there are no treatments to cure this however there are ways to alleviate symptoms. For example, frequent migraines can be treated with medication. Sometimes patients experience depression and anxiety from their concussion, so it is important to meet with a doctor to be prescribed with medication to treat this. Following a concussion, it is important to consult a health care professional to know when it is safe to return to one’s daily activities. It may take 1 to 2 weeks to return to normal activities if the patient has experienced memory loss or a loss of consciousness from their concussion. It is important to note that you should never return to a sports activity without being cleared by your doctor first. In addition, long-term rehabilitation may be necessary for those with a severe case of traumatic brain injury. This rehabilitation can be extremely beneficial for patients as it can maximize their function and independence. A change in one’s brain function can dramatically impact their family, job, social and community interaction.